My big brother and I had a thriving transport industry when I was small back in 1957. 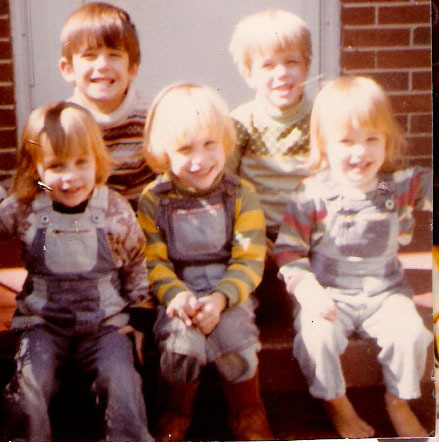 Our Dad sold construction machinery so our interests often led in that direction. Our new white brick house in the Gardenside neighborhood of Lexington, Kentucky had a basement below ground. To allow natural light into the basement, there were windows which were slightly below ground, and had corrugated wells or shells that surrounded them. These mysterious apertures were always lending themselves to mischief and made great hiding places. The Christmas when Mike received a crane and dump truck was unexpectedly warm and a temporary reprieve from the snow temporarily so we played outside every day. After learning to maneuver the crane and operate the bed of the dump truck, we had to find ways to put them to use. We gathered sticks, and piles of leaves and were making a general mess when we discovered the gravel down in the window wells. We hauled the gravel out of the well bucket by bucket, filling up the dump truck, till Mom said we had to stop and put it all back and smooth it out again. This stymied our plans so we had to get really resourceful for new materials to haul. Our cat had kittens a few weeks prior to this, so it occurred to Mike to go into the Kitten Delivery business. He set up shop in the back yard, making all those amazing mouth noises that little boys devise for their major machines, cranking it out and running it around with vigor. He would call out the orders as they came in from our demanding imaginary customers and get ready to deliver his product without delay. It was always my job to jump down into the well, which seemed 10 feet deep to me at the ripe age of 4. I would kneel down and capture a squirming kitten (placed there earlier by yours truly much to the chagrin of their Mama cat), then yell to the foreman (much older Joe Mike the master craftman–who was 7) to reel the bucket down. He loved that steel Tonka Crane that he’d received from Santa that year, and he would turn the hand crank that lowered the black steel basket down into the well with enthusiasm–sometimes cracking a kitten in the head, or plopping onto the unsuspecting little critter like a giant black claw. I would close the claw, tuck the little creature into the basket that it made, and yell, “Geronimo!” releasing the basket to watch it go toddling skyward to be dumped into the bed of his dump truck for hauling away. This was a slow and precarious process, as the cargo tended to pop out out of the truck bed almost immediately to go exploring. We kept at it until the Mama cat had enough, coming to rescue her little band Her bleating meows alerted our Mom, who caught us and put a stop to our innocent feline torture trials. We found other uses for t he crane and dump truck after that, just as adventurous as you’d imagine would come from the mind of a precocious 7-year-old. But that Kitten Transport Delivery service was probably the best time we had that Christmas and a memory that hasn’t faded in almost 60 years. You’re having turkey for Thanksgiving on Thursday, right? Well, that’s okay. Most of us are. What about before? And after? Sometimes that gets lost in the shuffle. Yet I like to try to make a firm contrast to the menus for the week so that the turkey stands out like crazy. Pre-Turkey, we go for a veggie day, so while I’m chopping all those ingredients for the turkey dinner, I manage to combine a large Veggiful Pasta Salad (recipe follows). We live on that for a day or two. Then after The Day, when everyone’s sick of turkey and the inevitable leftovers, I have all the ingredients ready for a Mexican buffet–just as completely DIFFERENT from Turkey as you can get. While you’re chopping everything but the kitchen sink to add to the typical Thanksgiving dishes, plan ahead and chop enough for the Pasta Salad and the Mexican buffet; you’ll be so glad you did. –A pan of browned ground beef that’s seasoned with chili powder, cumin, chopped onion or onion powder, garlic, and if you like heat add smoked paprika (if done ahead this is a breeze to thaw out–put the cooled meat mixture into a zip lock freezer bag, mashed as FLAT as possible and freeze–it will be a breeze to thaw in a pan of hot water in just a few minute when you’re ready for it). –My favorite dip, a brick of creamed cheese popped into a mixer bowl with enough picante sauce to thin it to your desired consistency. And as for dessert, you can go elaborate if you’re up to it this close to the holidays, or just place a bowl of chocolate covered mints at the end of the table and allow the food to be the star. BEFORE Turkey day, we always go vegetarian (actually, no one at my house knows this; but if they will think back, we never have anything substantial other than soup or veggie pasta on the day before The Day). Don’t skimp on the sweet stuff…the twang from the berries and citrus really makes a complete flavor profile with the pungent dressing and the smooth background of the pasta. 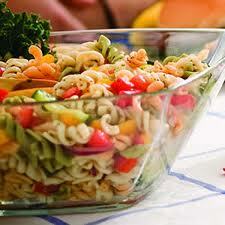 When you toss the pasta and veggies, the dressing you’re going to mix into them varies. Either be a wimp and use lots of Ranch dressing, the boring American favorite (just add extra dill). Or use a good Italian dressing–if you add in a large spoonful of mayonnaise with the Italian it will coat the pasta and veggies better. plenty of garlic powder (1/2 tsp or hopefully more) , 1-2 teaspoons paprika, a big dollop (1 tsp) of oregano, a shake of smoked paprika, a teaspoonful or so of sugar, 1 tsp of salt, 1/2 tsp of black pepper, then taste and see if it needs anything else. And if you have Anti-Vegetarians in the house, throw in a few shakes of REAL bacon bits and you’ve conquered that argument. A few cubes of Cheddar, American, or Smoked Gouda or a spoonful of Parmesan will do the same thing. Mix like crazy, then allow it to sit if you can leave it alone for an hour or so. I’ll cover my Tupperware bowl with the lid, and chill but pick up and shake really hard a time or two over the next few hours till meal time. ANY substitutions are welcome; after all, it’s YOUR salad. If you have corn, or yellow squash, or green beans–hey, it all works. Just toss it in. Bon Appetit and may God bless you as you give Thanks for all that He’s created and continues to provide. “Vernon Dalhart (April 6 ,1883 – Sept.14,1948) was a popular United States singer and songwriter of the early decades of the 20th century. He is a major influence in the field of Country Music. Dalhart was born Marion Try Slaughter in Marion County, Jefferson, Texas. He took his stage-name from two towns, Vernon and Dalhart in Texas, between which he punched cattle in the 1890s. Dalhart’s father, Robert Marion Slaughter was killed in a fight with his brother-in-law, Bob Castleberry, when Vernon was age 10. When Vernon was 12 or 13, the family moved from Jefferson to Dallas, Texas. Vernon, who already could play the jew’s harp and harmonica, received vocal training at the Dallas Conservatory of Music. 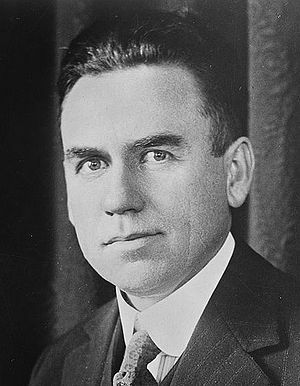 He saw an advertisement in the local paper for singers and applied and was auditioned by Thomas Alva Edison; he would thereafter make numerous records for Edison Records. From 1916 until 1923, using numerous pseudonyms, he made over 400 recordings of light classical music and early dance band vocals for various record labels. He was already an established singer when he made his first country music recordings which cemented his place in music history. Dalhart’s 1924 recording of “The Wreck of the Old 97” – a classic American railroad ballad about the September 27, 1903 derailment of Southern Railway Fast Mail train No. 97 near Danville, Virginia – for the Victor Talking Machine Company, became a runaway hit, alerting the national record companies to the existence of a sizable market for country-style vocals. It became the first southern song to become a national success. The double-sided single eventually sold more than seven million copies, a colossal amount for a mid-1920s recording. It was the best-selling single to its time, and was the biggest-selling non-holiday record in the first seventy years of recorded music. Please spend a few moments listening to a few of the hits recorded by Mr. Dalhart on You Tube. There have since been a Broadway musical and several movies showing different treatments of the story of Floyd Collins’ death. Yet however you think of Mr. Dalhart, the voice is a classic, the music a tribute to our country’s cultural concerns back in the 1920’s. Like Fishing? Help me Fish Up an Old 78! 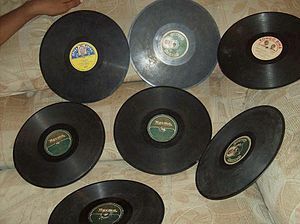 One of my better memories of growing up in the countryside near Lexington, Kentucky was learning all the words to my parents’ “platters”—their collection of 78 rpm records. Songs I learned included Blueberry Hill by Fats Domino, The Death of Floyd Collins sung by Vernon Dalhart, (see my next post) hits by the Andrews Sisters like Boogie Woogie Bugle Boy, big bands numbers like Tuxedo Junction, just a really eclectic mix of all my parents’ favorites. Mom let me spend hours in my chair. A slightly hyper three year old, I loved hanging sideways in the old maple Boston Rocker, head hanging off the edge, turning the world upside down, playing the 78 RPM records (and later 33 RPM albums) on the victrola. I was careful with them, almost never let one get scratched, and didn’t play tem too loudly for her comfort. In point of fact, I think she loved it when I turned them up louder occasionally. I’d sing along to my heart’s content, the little performer in training unaware of the young housewife listening in. One record, black with a red label, was titled, “The Fishing Song” and was sung by a female, possibly a black woman by her inflection. She had a trio of back-up singers who were all guys. I don’t know if my brother has the records now or not, but I haven’t heard the song played in 30 years or so. I’ve tried googling it, searching through ITunes too, to no avail. So we’re going on my memory here. ‘Mama told me I couldn’t go fishin’ with you. ‘Mama told me I couldn’t go fishing with you. ‘Papa took Mama fishing on the Rio Grande. I know for sure the song’s title is “The Fishing Song”. I’d like to know the singer, the record label, and where to get a copy of it if possible. So if you have any idea who sang this please let me know. Otherwise…beware that Fishing Game!